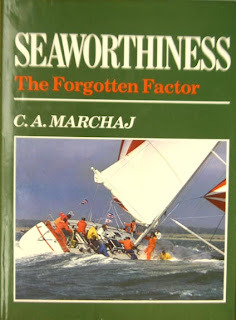 I just picked up a book called Seaworthiness, The Forgotten Factor, by C.A. Marchaj at one of the local used bookstores. The prose is a little dense but the author has a lot of good things to say. The author's premise is essentially that yacht racing has forced the design of racing yachts toward speed at the expense of seaworthiness and comfort. And unfortunately, racing fashions also seem to set the tone for cruising yacht design. The book was published in 1986 and it is quite possible that things have changed, but I suspect not much. Fashion after all trumps function every time. So the book focuses not on what makes a boat fast, the prime concern of racers but rather on what makes a boat seaworthy, the thing that should be of prime concern to the cruising yachtsman. So why do I read books about sailboats when I am a builder of kayaks? Two reasons: one is that I am starting to get interested in sailing and two that the study of kayak performance seems restricted to stability measurements on flat water and hull efficiency in tow tests. Another way of putting point two is that the only two things that kayak designers have any measure for is how far you can lean a kayak before it capsizes and how much resistance it offers to towing at various speeds. If you want to know how boats behave in other than flat water, you have to look beyond the kayak literature. And so it came as a pleasant surprise to find C.A. Marchaj's book on seaworthiness. Here was chapter after chapter of examination not only how a boat behaves in waves, but also how a boat behaves at various degrees of heel. Not all of this stuff applies to kayaks, but most of it at least gets a reader like me thinking about how kayaks and sailboats are different. But they are also the same in some ways. Forces that apply to one apply to the other. The question is what does one want to do about them and what sort of strategy works for a kayak but against a sailboat and vice versa. But above all, the book adds a third dimension to the discussion of how a boat behaves on water. A boat moves not just forward and backward and sideways, but up and down as well. Hull shape needs to take into consideration not just the movement on a flat surface but the movement in a vertical direction as well. Perhaps the greatest difference between a sailboat and a kayak is that sailboats in general are not meant to be inverted, that is, capsized. They are not built for complete inversion. Once they go past a certain angle of heel, they are likely to flood and sink. Not so a kayak. A kayak is so unstable in general that occasional inversion is generally expected and planned for. Surfing likewise is dangerous to sailboats but kayakers often seek out surf and when they do, they are likely to do so in kayaks that are especially designed for the surf. But the majority of recreational kayakers want to move about the surface of the water just like their sailboating cousins, that is without unplanned inversion while covering adequate distances. It is for these sort of kayaking conditions that Marchaj's book is instructive. That is to say, it attempts to answer the question, how can we built boats that behave well in rough water and avoid capsize. As such, it is a useful book even for the kayak builder.